Research at the Queen’s University Belfast has produced a major (and mind-bending) breakthrough, in the form of the first synthesized porous liquid. The new material has the potential for a massive range of new technologies including carbon capture. Researchers at Queen’s University Belfast, Northern Ireland, UK, have made the world’s first porous liquid by designing a molecule shape that can’t occupy space efficiently, thus creating ‘holes’ in the liquid. Researchers in the School of Chemistry and Chemical Engineering at Queen’s, along with colleagues at the University of Liverpool and other international partners have created the new liquid and found that it can dissolve an unusually large quantity of gas.The secret? 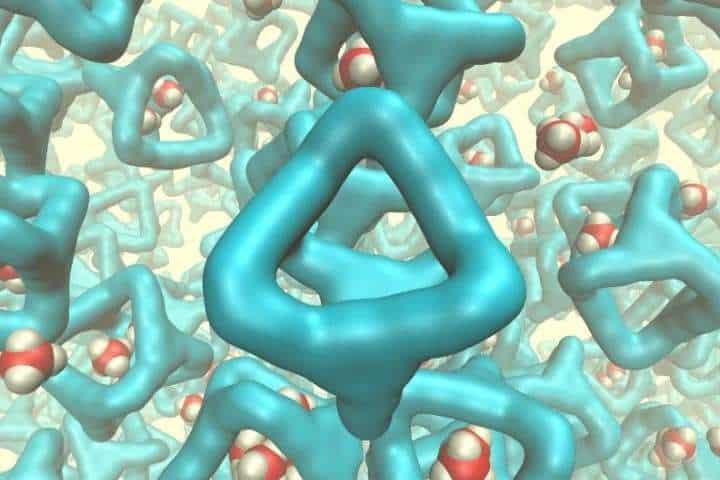 Gas molecules are shaped into little cages that trap gases in ‘holes’ in the liquid. “Materials which contain permanent holes, or pores, are technologically important. They are used for manufacturing a range of products from plastic bottles to petrol. However, until recently, these porous materials have been solids,” says Professor Stuart James of Queen’s School of Chemistry and Chemical Engineering. The material is the result of a three-year research project and could pave the way towards many more efficient and greener chemical processes, the team citing carbon capture as one of their intended uses for the porous liquid.